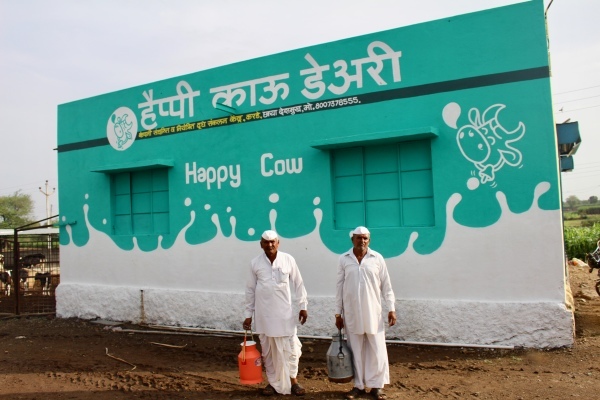 Milk from grass fed Happy Cows, directly sourced from Maharashtra Farmers. We bring milk to your home in shortest possible time to retain freshness. Modern, State of Art and computer operated machiens to collect milk. Safe packagng & Company controlled sitribution. To offer consumers safe and pure milk. To address major concern of housewife whether the milk, her child drinks is safe and free from adulternation. Happy Farmers, Happy Cows and Happy Consumers. If cows are happy, they will give good quality of milk. If farmers are paid remunerative price, they will feel happy and do a good job in maintaining cows and deliver adulteration free, fresh milk every day. When consumer gets fresh, pure and safe milk, happiness is visible. We are a start up with each member having average 10 years of experience in dairy. Business management graduates, Dairy Engineers, Veterniary Doctors and Electrical engineers. We understand what cow needs, what farmer needs and what consumer is looking for in milk. Moowing is milk with no disturbance. We don't add water or milk powder or any other ingredient to milk. There is no need of vitamin fortification becasue moowing is without any toning of milk. Milk as given by Happy Cows. We bring it to your home straingt from our dairy farmers farm from rural Pune and Nagar. In less than 24 hours from milking it reaches your home under company controlled supervision. All these reasons make Moowing taste natrual. Drink without worrying. Moo.. sound a Happy cow makes.